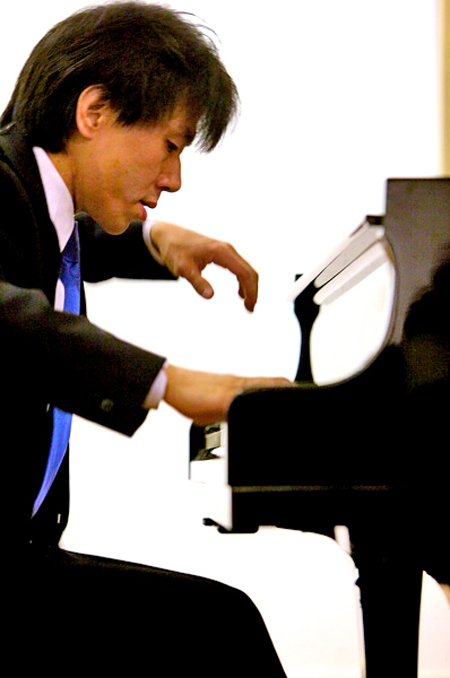 In another example of the richness of Shelter Island’s music scene, Taka Kigawa inaugurated the 2012 Friends of Music season on Sunday, February 19 at the Presbyterian Church. The youthful Japanese pianist offered a program of Debussy, Liszt and Chopin with a terrific mix of the elegant and the sublime. Debussy’s “L’Isle Joyeuse” lets us into that enveloping impressionistic world that ruled the arts in the opening years of the 20th century. Chopin’s Ballades No. 2 and No. 4 allowed the pianist to show his lyrical side and the familiar G Minor Ballade evoked expressions of recognition and appreciation from the very large audience. The venue for these concerts is the sanctuary of the Presbyterian Church with its extremely lively acoustics that offer a challenge to many performers. Subtleties in works like the gorgeous Debussy piece can get lost unless the performer can adjust to the inherent loudness that the acoustics provide. Some works actually benefit from the lively sound, like the Sonata in B Minor of Franz Liszt. While some pianists value this sonata for its showy virtuosic potential, Mr. Kigawa brought real expressive depth to this massive — nearly 40 minutes — work. Written in four uninterrupted movements, the interior drama of the work was so vividly developed that while Mr. Kigawa looked cool and unruffled at the end, the audience was left breathless. Musicians and musicologists have argued for over 160 years about the significance of, and the symbolism in this work. But with a performance as stirring as Mr. Kigawa’s, the sonata’s reputation as Liszt’s greatest work is assured. With encores by Chopin and Debussy, Mr. Kigawa received a standing ovation and demands from the audience for a return engagement.